The Tournament Committee’s interpretation of these rules shall be final and binding. The Tournament Committee reserves the right to decide all matters pertaining to this tournament. A team shall be allowed a 5-minute grace period after the scheduled kick-off in the preliminary rounds before the match is awarded to their opponent. A minimum of 4 players constitutes a team, and if 4 players are present the match may not be delayed. If during the course of the match a team falls below the minimum 4 players, the game will be forfeited to their opponent. A team that has forfeited a game may not advance to the finals. If an apparent group winner forfeits, the group team with the next best record will be declared the group winner. A forfeit in the preliminary rounds shall be awarded as 3 points for a win with the score 3-0. At the conclusion of the preliminary matches, each team will be ranked according to their performance. This ranking will determine the teams that will meet in the next round and/or final matches. The team with the most match points finishes first. If 3 teams are tied for any position, the above process will be used, except head-to-head competition will be eliminated and the first tiebreaker will be least goals allowed. A match that has been canceled by the Tournament Committee will be awarded a 0-0 tie. For round-robin tournament play, if the score is tied at the end of 3 periods, the teams will play one full 3 minute overtime period. If the game remains tied then the game will go to penalty kicks. The best of three kicks from the spot. If still tied penalities for to sudden death. For quarter-final, semi-final and championship play the same preceding rules will be enforced to determine the winner of the match. If the score is still tied, kicks from the imaginary penalty mark in accordance with the procedure stipulated. FIFA “Kicks from the Penalty Mark” rules will apply to determine the winner. If, before both teams have taken three kicks, one team has scored more goals than the other could possibly score in its three kicks, the winner is declared and no more kicks are taken. If, after both teams have taken three kicks, and have scored the same number of goals, or not scored at all, kicks continue to be taken alternately until one team scores one goal more than the other from the same number of kicks. Champions of each Qualification Age group (13u – 19u, Men, Women, Coed) will receive free entry (value $1,800.00) to USBSNC. There are eight qualifiers around the country with each providing a single team in the qualification age groups. If any age group in qualification is not able to provide a champion to the USBSNC Runnerups as Wild Cards. The tournament committees for each event will determine the best & highest level Runnerups from each region for the Wild Card. At the end of each event, the semi-finalist will be evaluated and seeded for future competitions. 12 players max. on a Roster in ALL divisions; a min. of 3 females required (4 recommended) for Co-ed teams; two females must be on the field at all times during Co-ed games. (*Note at qualifiers and national final a roster of 14 is allowed, but no team is allowed more than 12 players on their bench in uniform/sweats at any one time. Violation of this rule will result in a forfeit in the match). Size varies by age group. Youth: 25×35 yards, Adults: 30×40 yards. Goals are 7 feet tall and 18 feet wide. Min. 3 females required on Co-ed team rosters. 2 females to be on the field at all times. Novice (Rec. or Upper House) or Competitive (Select or Travel). Each team will play a minimum of 3 games in the Group Stage. Forfeited games will result in a win and 3 points for the non-Forfeiting Team. No additions, substitutions or deletions may be made to your roster after you hand in your final roster at Check-In. Teams which are split into 2 teams cannot have players play on the other team at ANY time once the final rosters are posted. Teams in “Qualifying Age Groups” once rostered are cup-tied to team for the current year. Bring your own uniforms. These can include customized jerseys, t-shirts or tank tops appropriate for a family beach. If no distinguishing clothing can be found, one team will be supplied scrimmage vests by the Pro-Am Beach Soccer Tournament. Numbers are mandatory. *Keep in mind the climate on a beach varies* * Note: Teams progressing from Qualifier to Nationals Numbers and “Names” are mandatory. No shoes, cleats or shin guards of any kind are allowed. Players can play either barefoot or with socks (preferably sand socks). Additional wrapping tape is recommended (on your bare feet or on the outside of your socks) in order to better protect your feet (hot sand, etc.). No jewelry of any kind is allowed. This includes watches, earrings, etc. No players with casts, air-splints, or metal splints of any kind will be allowed to participate. Two flagpoles delineate the penalty area on each side of the playing court. The two flagpoles are placed 10 yards from each corner. Two imaginary lines, parallel to the baselines and unifying the penalty flags, define the penalty areas. The exact positions for penalty kicks shall be the center of these penalty lines. Four flagpoles are placed in each corner of the playing sand court. Two flags are placed in the center of the court and define the mid-court line. The referee shall make a coin toss to decide which team has the option to kick-off or the choice of the side of the court. The players of the opposing team shall be positioned at least at five yards from the ball. After a goal, the game continues and restarts with a new kick-off, taken by the team that has allowed the goal. A goal cannot be scored directly from the kick-off. All kicks are direct, except for the kickoff. The referee will award a free kick from the point where a foul was committed. The player who suffered the infraction must execute the kick. The kick shall be “direct”, from which a goal can be scored directly against the defending side. A player, after executing a free kick, may not touch the ball twice consecutively. The breaking of this rule will be punished with a free kick where the infraction occurred. If the infraction is committed against the offensive team in the offensive team’s attacking end, no defensive players may form a wall. Until the free kick is executed, all players must position themselves behind or on the same line as the ball placed at the point where a foul was committed, and they must remain at a minimum distance of five (5) yards from the ball. The defensive goalkeeper must remain in his penalty area and at least five (5) yards from the ball, but may stand on the goal line regardless of distance from the ball. If the infraction is committed in the offensive team’s defensive end, all other players, excluded the player taking the free kick, must remain at least five yards away from the place of the infraction, wherefore the free kick will be taken. The players, except the defending goalkeeper, cannot position themselves in the area directly between the goal, toward which the kick is taken, and the ball. No players shall enter in such area before the free kick has been taken. No players shall be allowed to touch the ball before it has touched the sand, the defending goalkeeper, a post or the crossbar. If any irregularity happens when a free kick is being taken, the following will occur: If the team that is taking the free kick commits the irregularity, a new free kick shall be awarded to the defending team from the point where the infraction has taken place. Any player of that team shall be allowed to take the direct kick. If the originally infringing team commits the irregularity, and a goal is not scored because the ball has been blocked, a new free kick will be taken from the point where the original or new infraction has taken place, kicking teams choice. In case this point is in the penalty area, a penalty kick shall be awarded. If the irregularity is committed by the originally infringing team, and a goal is not scored because an infraction of invasion of the restricted area has occurred, the free kick shall be repeated by the same player. If the originally infringing team commits the irregularity and a goal is scored, the goal shall be validated. A penalty kick shall be awarded when a player inside his own team’s penalty area commits a foul, while the ball is in play. The player who has suffered the infraction must take the penalty kick, with the exception of a pass-back. The ball shall be placed at 10 yards distance from the center of the goal. All players except for the defending goalkeeper shall position themselves outside the penalty area, and they can enter into the penalty area only after the ball has moved as the result of the execution of the penalty kick. When taking a penalty kick, a player is allowed to place the ball on the spot of the foul and make a small sand lump, thus elevating the position of the ball. The player who takes the penalty kick must do it in a continuous movement. Any player can play the ball once it rebounds from the defending goalkeeper. The player who has executed the penalty kick shall not be allowed to play the ball once it rebounds directly from a goal post or from the crossbar. When defending a penalty kick the goalkeeper must position himself on the goal line between both goal posts. If the team that is taking the penalty kick commits an irregularity and the goal is scored, the shot will be repeated. If a goal is not scored, the defending goalkeeper shall restart the game. If the defending team commits an irregularity, the free kick will be repeated in case a goal has not been scored as the result of the penalty kick. If the defending team commits an irregularity and a goal is scored, the goal shall stand. The goalkeeper’s re-start is awarded when one player of the attacking team plays or deflects the ball over the baseline, excluding the goal itself. The goalkeeper shall restart the play with his hands and has five (5) seconds to do so, from the moment he stands and he has control of the ball. If the goalkeeper delays the game for more than five (5) seconds or re-starts the game passing the ball to his feet, the other team shall be awarded a free kick from the mid-court line. The goalkeeper cannot score a goal using his hands. In such case, the other goalkeeper shall re-start the play. The goalkeeper can score a goal only as a regular player, kicking the ball only once it has been passed to him by another player. The goalkeeper shall not be allowed to touch the ball with his/her hands or arms two consecutive times when a ball is returned to him/her from a player of his team, including a header or an inbound pass, without the ball having touched an opponent player. An infraction of the “pass-back rule” results in a penalty kick against the team that did commit the infraction. The corner kick shall be given when a player of the defensive team plays or deflects the ball out of bounds through his/her team’s baseline, not a goal. A player of the attacking team must take the corner kick. The ball shall be placed within a one (1) yard radius from the corner. A corner kick is a direct kick. The defending players can position themselves at a minimum distance of five yards from the corner. If a defending player shall touch or block the ball inside the five (5) yard radius directly from a corner kick, the corner kick shall be repeated. When taking a corner kick a player has five (5) seconds to execute the kick from the moment that he has possession of the ball. If a player shall infringe his five (5) seconds time limit, the opponent goalkeeper shall restart the play. The ball inbound is the method of restarting play when the ball touches outside a sideline. The ball inbound must be taken from behind the sidelines. The game shall be restarted from the point where the ball crossed the sideline. To inbound, the players shall use their hands (both hands, starting their action holding the ball behind their head and keeping both feet on the sand), or feet. A goal cannot be scored from a ball inbound. The player shall have five (5) seconds to inbound the ball. By infringing this rule, the ball inbound shall be reverted to the opposing team. Do not mound the sand for a kick-in. All teams must use the online e7sports Team Registration & Payment system to sign up and pay for their team for a tournament. You will find the “register your team” link on the front page. Please contact us directly and we will assist you with any problems you may have. An email will be sent to your team upon receipt of the Registration Form & full Team Entry Fee. A Pro-Am Beach Soccer representative will also follow up with a phone call. Acceptance: Your team will NOT be officially secured a spot to participate until your Registration Form and full Team Entry Fee have been received. Please go to the Check-In link under General information on our website for more information. Roster Changes No additions, substitutions or deletions may be made to your roster after the Group Stage of competition is completed. No refunds in the event your team drops/withdraws from a tournament. All tournaments are played even if it rains. In case a tournament is postponed, there are no refunds, but your Team Entry fee will be applied to a future date. The Pro-Am Beach Soccer Tournament respects your privacy and is committed to protecting the personal information that you share with us. Some personal information is required of all users to allow to prevent unauthorized access to the online registration system. 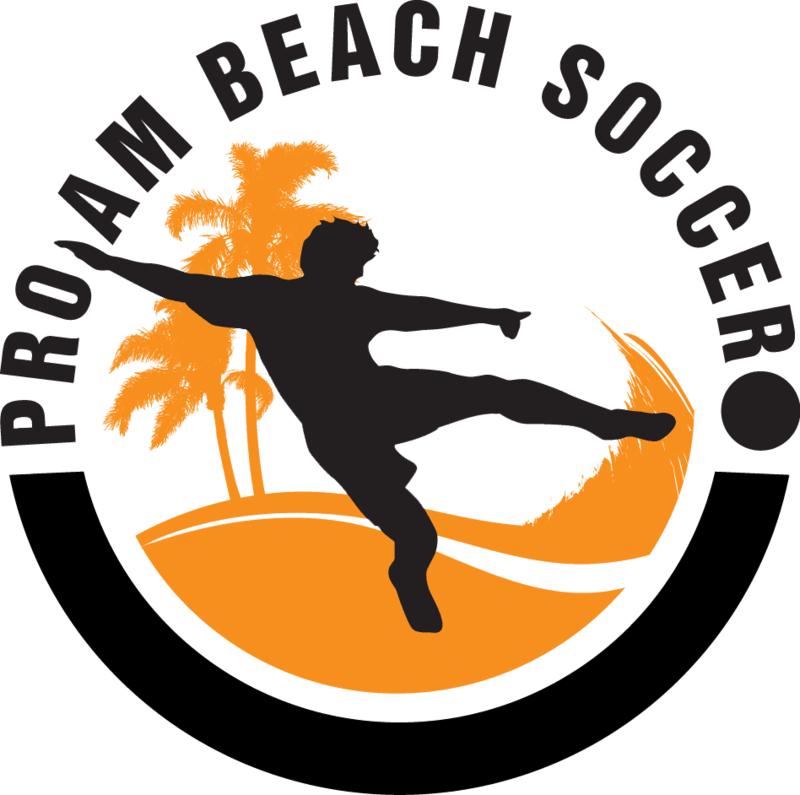 Call the Pro-Am Beach Soccer Tournament office at 415-308-0603 or send an e-mail to info@proambeachsoccer.net.